During 1975, a number of Krautrock’s most innovative bands released new albums. The year began when Neu! released their third album Neu! 75 in January 1975. This got the ball rolling. Over the next eleven months, many of the leading lights of the Krautrock scene released new albums. Harmonia released their sophomore album Deluxe; while Cluster released Zuckerzeit and Can Landed. Amon Düül II returned with Made In Germany and Kraftwerk with Radio-Activity. Manuel Göttsching released his landmark album Inventions For Electric Guitar; while Popol Vuh released Das Hohelied Salomos. Many of these albums would eventually be regarded as Krautrock classics. However, another album released during 1975 which was a much more low profile release. This was Tyll’s debut album Sexphonie, which will be rereleased on the Metal Experience label on 9th June 2016. Sexphonie is an album that back in 1975, was shrouded in mystery and controversy. Indeed at one point, it looked like Tyll’s debut album Sexphonie would never be released. It was, and proved to the opening and closing chapter in the Tyll story. The story behind Tyll began back in early 1975. That was when Fred Kersten, the owner of Kerston Records, approached Teflon Fonfara to ask if he would be interested in recording a Krautrock album. For Teflon Fonfara this was interesting proposition. Especially since his previous group Eulenspygel had been put on hold. They hadn’t released an album since Ausschuß in 1973. Two years later, and there was no sign of the group returning to the studio or heading out on tour. It was beginning to look as if there was little chance of Eulenspygel reuniting. So Teflon Fonfara decided to take Fred Kersten up on his offer of a week’s studio time. After all, man cannot live on bread alone. As a familiar face on the local music scene, it didn’t take long for Teflon Fonfara to put together a new studio band. One of the earliest recruits was Eulenspygel’s drummer Günter Klinger. Teflon Fonfara thought nothing of this. After all, Eulenspygel had been put on hold; and it wasn’t even clear if the band would reunite. However, the decision to bring onboard Günter Klinger would prove to be a controversial. That was in the future. With drummer Günter Klinger onboard, Teflon Fonfara concentrated on recruiting the rest of the band. They were all friends of Eulenspygel. This included bassist Achim Bosch and vocalists Michael Scherf, Susanne Schempp and Ulrike Schempp. They were joined by Teflon Fonfara who appeared as Del Fontana. With the lineup finalised, work began on Tyll’s debut album. For what became Tyll’s debut album Sexphonie, Teflon Fonfara wrote seven of the songs, and penned Siamesische Überraschung and Grammophon with Achim Bosch. His other contribution was Rita. Ulrike Schempp wrote Für Michael Pfadpfinder; while Michael Scherf contributed the album closer Morgenlicht. These twelve songs would recorded at TFE Studios. On 1st April 1975, Tyll arrived at TFE Studios, Neustadt, Weinstraße. The six members of Tyll were ready to record the twelve new songs. Producing Sexphonie was Fred Kersten, who owned his own record company, Kerston Records. It would release Sexphonie once it was completed. So the members of Tyll got to work. At TFE Studios, Tyll’s equipment was unpacked and setup. Then Tyll began recording their debut album. Things were happening fast. It was only a couple of months since Teflon Fonfara put together Tyll. Now the rhythm section which featured drummer Günter Klinger and bassist Achim Bosch began laying down the rhythm tracks. Then it was Teflon Fonfara’s turn to lay down the guitar parts. Once this was complete, it left just the vocals to be added. Tyll’s trio of vocalists, Michael Scherf; Susanne Schempp and Ulrike Schempp began laying down the vocals. Once the vocals had been recorded, Tyll had completed their debut album. The six members of Tyll hd spent just twelve days recording their debut album Sexphonie. It was completed on 12th April 1975. With Sexphonie recorded, now Tyll and producer Fred Kersten were able to reflect on how quickly and smoothly things had gone. It wasn’t long since Fred Kersten first approached Teflon Fonfara about putting together a studio band. Now Tyll had recorded their debut album Sexphonie, and it would soon be released. Or so they thought. What neither Fred Kersten nor Teflon Fonfara foresaw, was the threat of legal action that loomed over the release of Sexphonie. Eulenspygel weren’t happy that Tyll had poached or stolen their drummer, Günter Klinger. They threatened Tyll with legal action. This could’ve been disastrous, and resulted in a long and expensive legal battle. Luckily, common sense prevailed, and Tyll were allowed to release Sexphonie. Even the threat of legal action hadn’t unduly delayed the release of Sexphonie. Still, only a matter of months had passed since Fred Kersten approached Teflon Fonfara with the idea of releasing a Krautrock album. Now, the newly formed studio band Tyll were about to release their debut album Sexphonie. When Sexphonie was released later in 1975 by Kersten Records, the album wasn’t a commercial success. Certainly nobody was going to get rich after the release of Sexphonie. However, those who bought a copy of Sexphonie discovered an album were Tyll fused acid-rock with hard-psych, polit-rock, progressive rock. There were even the occasional excursion into avant-garde, folk, funk and polit-rock. Sometimes, Eastern influences shawn through on Sexphonie a hidden Kraurtrock gem. Following the release of Sexphonie, Tyll never released a followup album. Sexphonie proved to a one-off musical experiment from Teflon Fonfara’s studio band Tyll. However, nearly a generation later, and Tyll’s debut album Sexphonie began to attract a cult following. By then, copies of the original album were real rarities. Very few copies of Sexphonie ever change hands. When they do, the price is beyond most record buyers. This meant that Sexphonie was out of reach of most record buyers. Not any more. The Metal Experience label will reissue Sexphonie on 9th June 2016. As you’ll soon realise, it’ll be a welcome reissue. Tim opens Sexphonie. Just a Spanish guitar plays firmly and briskly. Flamboyant flourishes punctuate the arrangement, before a searing guitar cuts through the arrangement. It’s joined by the rhythm section. Before long, there’s a mesmeric nature to the drums. Then midway through the arrangement, Tyll throw a curveball. The track meanders, as grating, jarring, dramatic sounds add an experimental sound. That’s until Tyll kick loose, and a blistering rocky track unfolds. Teflon Fonfara’s guitar plays a starring role, as he unleashes a series of searing licks. Matching him every step of the way are the rhythm section. That’s until a myriad of beeps and squeaks signal that this captivating rocky track is almost over. However, it whets the listeners appetite for this hidden gem of an album. Sexphonie is one of the shorter tracks on the album. However, it doesn’t lack in quality. Quite the opposite. Straight away, the rhythm section and quivering, bristling guitar unite, before an impassioned, powerful male vocal is added. It’s augmented by sweet, punchy pop harmonies. Meanwhile, blistering guitars are unleashed. They add a lysergic sound. Meanwhile a nimble fingered bass line sits atop the drums, as genres melt into one. Acid rock, pop and psychedelic rock combine to create a catchy and memorable track. A lone guitar plays slowly and thoughtfully on Asiatische Liebeserklärung. Its crystalline sound is joined by Eastern sounds. They create an understated arrangement. That’s until 1.47, when the rhythm section and the guitars join. This fills out the arrangement, and transforms it. Soon, the Eastern influence dissipates, and the track heads in the direction of progressive folk. This allows Tyll to showcase their talent and versatility. Just a crystalline guitar is strummed and sets the scene for the vocals on Paranoia Eines Verliebten. They’re shared by a male and female vocalist, and range from heartfelt to emotive, to powerful and dramatic. At the moment the vocal changes, so does the arrangement. The rhythm section frame the vocal and add an element of drama. Briefly, Teflon Fonfara adds a funky, chiming guitar. Later, a manic laugh punctuates the arrangement. So do effects that come courtesy of Teflon Fonfara’s tapes. By then, the story is unfolding, and the drama building on this genre-melting track. Elements of psychedelia rock, folk, funk and avant-garde combine to create a song that sounds as if it belongs on an early seventies Krautrock concept album. However, Sexphonie was no concept album. There was neither a concept nor message on Sexphonie. Instead, Sexphonie was almost a reaction against the concept albums of the first half of the seventies. Teflon Fonfara was no fan of them, and seemed regarded concept albums as overblown. He was unwilling to further romanticise concept albums, never mind record one of his own. Instead, this musical maverick recorded what was an innovative musical adventure. From the distance, Eastern percussion adds an eerie cinematic sound to Nervenzusammenbruch Einer Gitarre. Soon, a probing bass adds to what’s an unsettling sounding track. It sounds as if it would be perfect for a horror movie. That’s until a blistering guitar cuts through the arrangement. Before long, the unnerving sound is almost gone, and is replaced by a futuristic sound. At the heart of the arrangement is the rhythm section and guitar. The rhythm section drive the arrangement along, while the guitar rings out, and plays a starring role. Effects are added, as the guitar is the last man standing. From there, the arrangement meanders melodically along, before its melancholy sound is just a pleasant memory of what’s been a memorable musical adventure. Teflon Fonfara delves into his tapes, and adds the sound of animal as Siammesische Überraschung unfolds. Meanwhile, he adds effects and they add an otherworldly sound to the avant-garde soundscape. Midway through the track, a bass joins a jazz-tinged guitar. They’re like yin and yang, and prove a perfect foil for each other. That’s until a curveball is thrown. The guitar and bass are replaced by the sound of a music box, which adds a wistful reminder of another era. It’s another innovative, musical potpourri from Tyll, as they continue to push musical boundaries. There’s a melancholy, cinematic sound to Kristinas Traum as a crystalline guitar chimes and is joined by a bass. In the background, the wind roars and gusts, while a clock chimes. Together, they create a melancholy, cinematic soundscape. Delirium Song-Grammophon is a seven minute epic. A rumbling bass leads the way, before scorching guitars, pounding drums and vocals enter. Male and female vocalist share vocal duties. Meanwhile, the arrangement is driven along, with the bass and bristling guitar playing starring roles. The vocals are impassioned and delivered quickly. Adding to the drama, is the rhythm section. They provide the perfect backdrop to vocals that veer between urgent to tender. Later, Teflon Fonfara unleashes another of his blistering guitar solos, before what sounds like the helicopter soars across the arrangement. Not to be outdone, a fleet fingered bass line helps propel the arrangement along. Everyone plays their part in the sound and success of what’s a dramatic, urgent and later futuristic and melodic epic. It shows yet another side to musical chameleons Tyll. Rita has a much more understated and sedate sound. Just guitars and the bass combine as the arrangement meanders melodically along. There’s a wistfulness to the arrangement, as strummed and crystalline guitars combine with the bass. Later, Teflon Fonfara adds the sound of a thunderstorm to the arrangement. This works and adds the finishing touch to a melancholy, cinematic track. The tempo increases on Suzie Steno, as a bristling, scorching guitar cuts joins the rhythm section. They’re soon joined by the a male lead vocal, which tells the story of Suzie Steno. Augmenting the vocal are harmonies, which sometimes, soar above the arrangement. Framing the vocal are the crystalline guitar and the rhythm section, which provides the heartbeat. Later, when the vocal drops out, another blistering guitar solo takes centre-stage. Its briefly joined by one of Teflon Fonfara found sounds. From there, the rest of this slick slice of hook-laden pop-rock shows its secrets. Für Michael Pfadfinder is another ballad from Tyll. Just a guitar is strummed as the rhythm section play slowly. They set the scene for the two female vocalists. One sings lead, while the other augments her vocal. There’s a sense of sadness in their heartfelt, emotive vocals. Then when the vocal drops out, Teflon Fonfara steps up, and delivers a bristling, shimmering guitar solo. He then takes his leave, and the vocalists return as this beautiful, melodic and wistful ballad draws to a close. Morgenlicht closes Sexphonie. A guitar is strummed slowly and deliberately, before Michael Scherf delivers his vocal. It’s accompanied by harmonies, and is delivered slowly and with a sense of sadness and regret. Teflon Fonfara adds a mini collage of sound, before this rueful sounding track is but a distant memory. However, Sexphonie is not an album to forget in a hurry. Far from it. Sexphonie is a truly memorable debut from Tyll. It was an innovative album of genre-melting music. Lead by Teflon Fonfara, Tyll set out to create the Krautrock album Fred Kersten wanted. To do that, Tyll combined acid-rock with hard-psych, polit-rock and progressive rock on Sexphonie. There were even occasional excursion into avant-garde, folk, funk jazz, polit-rock and pop. This musical melting pot of genres and influences resulted in Fred Kersten getting the Kraurock album he wanted. Sexphonie was a captivating album of groundbreaking music, where no two tracks were the same. Tyll were musical chameleons, who could create music that was variously beautiful, cinematic, dramatic, lysergic and melancholy. Other times, the music on Sexphonie was progressive, rocky, melodic and mesmeric. Alas, the album wasn’t a commercial success. When Sexphonie was released in 1975, that album passed record buyers by. This was a familiar story. Even albums by some of the biggest names in Krautrock failed to find an audience first time round. Neither Harmonia nor Neu! were getting wealthy making music. Sadly, neither were Tyll. After the commercial failure of Sexphonie, Fred Kersten of Kersten records decided not to release a followup album. It was a case of once bitten, twice shy. That was a great shame. Maybe, Tell would’ve made a breakthrough next time around? However, we’ll never know. 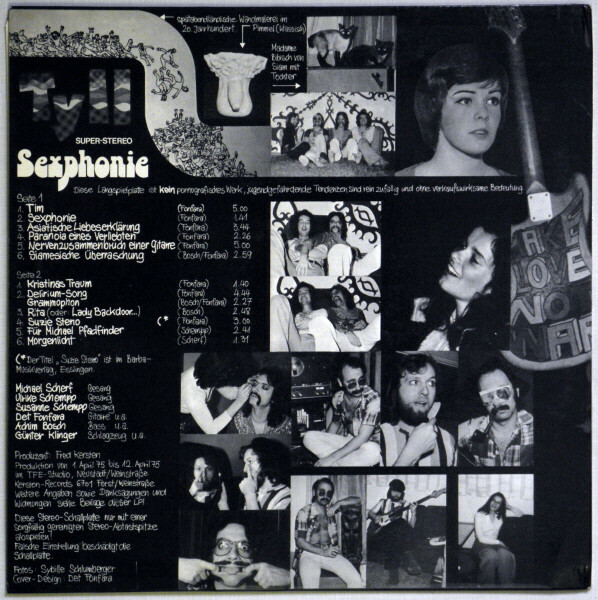 Sexphonie was the only album featuring Tyll, a truly talented and versatile band. They weren’t together long, but left a lasting impression. Tyll were founded in 1975, and by the time the year was over. the band was history. Despite being together less than a year, Tyll left behind a memorable musical legacy. That’s their groundbreaking debut album Sexphonie. If finds Tyll switching seamlessly between musical genres, as they create what’s nowadays regarded as a hidden gem and a lost Krautrock cult classic, Sexphonie. ← PHIL’S SPECTRE-A WALL OF SOUNDALIKES.